Imagine warm clear waters, colorful underwater reefs and fascinating aquatic life forms with stunning, sheer walls, large graceful pelagic and breathtaking beaches of powdery soft sand. These captivating sights will be yours to enjoy in the abundance of dive sites in Malaysia. · Pulau Sipadan- Lying just off the northeast coast of Borneo is Sipadan, Malaysia’s only oceanic island. It offers more than just turtles; it guarantees that every dive is a memorable experience. At the Drop Off, five metres of white, soft sand in knee-high water suddenly gives way to a precipitous drop of discovery. Follow the vast wall around as you drift with the current, exploring the corals that inevitably form refuge for the fish. A night dive here may yield a chance encounter with these large fish as they sleep. · Pulau Redang- For its sheer alluring beauty, Redang remains one of the most popular islands in Malaysia, and a must-see for any traveler keen on exploring the best of Peninsular Malaysia’s diving. The waters here sparkle with an aquamarine shade, and the sand is invitingly soft in its own pearly whiteness. · Pulau Layang Layang- A world-class dive site of unique character awaits you here. Layang Layang is a ring of 13 coral atolls in the midst of the South China Sea. Your best chance of spotting hammerhead shark lies here. 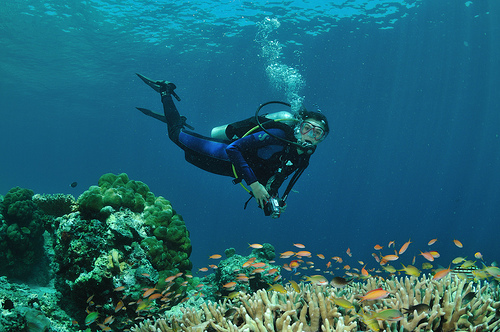 Buoyancy control is your key to enjoy the diving here. Sponges and sea whips add variety to this visual feast. · Miri & Labuan- Miri, an oil-rich coastal town in Sarawak is known for its cosy charm and friendly atmosphere. Despite its laid-back appearance, it is growing in popularity as a destination for underwater enthusiasts. Take a ride out to the oil rigs, and on your way, you will be sure to chance upon a dive site worth remembering. Beneath the waters, the downward slope of the shore flattens out into calm bottoms that host the richest reef life in Malaysia. · Islands of Johor- The southern state of Johor is blessed with beautiful islands and splendid diving opportunities not to be missed. The most popular sites for diving here are Pulau Aur and Pulau Dayang, which are also the furthermost islands from the mainland. In Malaysia, the avid diver will find a fascinating variety of underwater attractions available nowhere else in the world. So book your tickets now and get ready to dive in Malaysia.